BioBizz TopMax fuels prolific blooming while enhancing the flavor of herbs and vegetables in any garden. 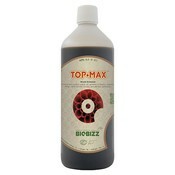 TopMax is perfectly suited for soil but can be used in other growing media as well. All BioBizz products are certified organic by the Organic Materials Review Institute (OMRI).